Relatively Speaking represents one of the major benefits of membership in the Alberta Genealogical Society! I was delighted to receive my electronic version of RS and promptly proceeded to read most of it on my tablet. Please pass my compliments on to your editorial board for a very informative, entertaining journal. A member of AGS, ... I am so impressed with the latest issue of Relatively Speaking. It is a page turner, hard to put down. 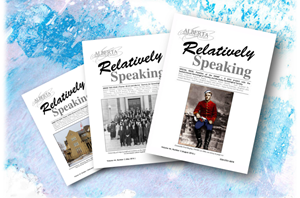 Each issue of Relatively Speaking includes informative and entertaining articles concerning individual family history stories as well as advice on sources of genealogical information and methods of research. Summaries of the titles of past articles along with lists of contents for issues can be found on the website. Simply click on the year of interest to the left and then select Summary of Feature Articles for the particular issue. A selection of some of the more notable stories published over its 40-year history can be found under Stories on the website. a forum to post queries and exchange information and research tips. The journal is published quarterly in February, May, August and November. The publication is currently delivered in print form and by electronic means. Beginning in late 2016, Relatively Speaking was delivered to all AGS members in digital format (PDF); and, those specifically subscribing to the print edition received copies in both formats. Members still have an option. AGS Members may read the current and the last four years of the digitized RS on the Members Area pages of the website. Submissions are welcome from anyone interested in family history. A style guide for authors can be found here that offers advice and assistance as to size, accompanying images, references and subject matter. We especially encourage articles appropriate to our Mission Statement, in particular those that demonstrate how writers arrived at their conclusions and that show the sources of their data. Contact the Editor for more information on how to get your story published. February is usually a time for romantic and family stories. In this issue we begin with an article on ten marriages in Gloria Cathcart’s family then on to England and a meeting that led to marriage in the Perkins family. Two other families are featured in stories based on looking for lost relatives in the Lee Koop’s tale of a cemetery that went bankrupt and Bob Franz search for his grandmother. These searches may lead some to consider writing the history of their family so that their family would be saved the work of searching and the frustration of dead ends. 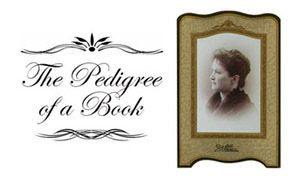 Lynne Duigou provides some ideas and suggestions for things to consider and ways you might proceed from her experience in writing several of her own family histories and a local history. Since your search for family may include the internet, Lianne Kruger has provided some tips for genealogists on Social Media. We are pleased to be able to continue to feature another youth writer in the “Youth Write On” section. John Althouse again brings local history alive with his feature from “Visiting Alberta’s Past” with an article titled “The Bricks of Medicine Hat”. November – Military (con­tributions to the war effort by small towns, the Spanish flu, small town newspapers, conscription, military medals, military service records and stories etc.). Other articles not on a theme but with an Alberta connection are always welcome. Tell us all about your travels, your discoveries, successes and roadblocks. Submit your story and photos for publication no later than 15 January 2019. Email us at rseditor@abgenealogy.ca. Gramma, What are You Doing Over There? So You Think You Want to Write Your Family History! Feb/May 2005, A Tribute to the Irish! Sometime ago, a renovation crew was preparing to do some work on an old house in Wetaskiwin. During their groundwork they found an old photo album in the attic. In fact, a crew member is the son of a Wetaskiwin member. Find out what happened to the album. All of the past issues of Relatively Speaking from 1973 to the present have been fully digitized and available for viewing and downloading from our Digital Library. The issues are available to acquire in PDF format and are keyword searchable.